With our NeuRA building on Barker Street, Randwick nearing completion, it’s interesting to look back in time at the history of this site. In 1855, sixty acres were selected as the site for the new Destitute Children’s Asylum for orphaned children. The main buildings were located north of our NeuRA site on Avoca Street; some still remain. The NeuRA land was sparsely covered with grass and on the side of a sand dune with a shallow dip to the west. Facing north, a cemetery for the Asylum was established in 1863. To make way for further hospital development, it was excavated and relocated several years ago. In 1884, two pairs of semi-detached cottages were built on waste ground south of the main buildings (NeuRA’s current site) for staff working at the Asylum at a cost of £2191-13-11. Reports for the Asylum record improvements in 1889 and 1904 and the buildings were described as “renovated in 1913”. Around this time the Asylum had been converted for use as a military hospital and has continued as a public hospital since. 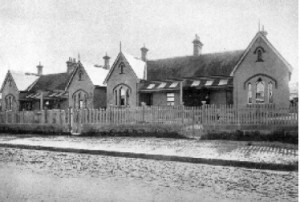 Throughout the twentieth century, the cottages were still used as private houses while the hospital expanded up to and around them. They were demolished in the 1980s to make way for a new hospital building (the Villa), since demolished for the present building. 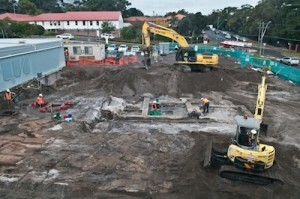 As part of NeuRA’s redevelopment of the site in 2011, an extensive archaeological program was undertaken to document the evidence of the cottages and surrounding land. The construction of the Villa building had removed large parts of the cottages but sufficient remained to allow our archaeologists a reconstruction of their plan. Consistent with many buildings of that era, each cottage had large sandstone foundations dug into the underlying dune sand. Each had four rooms and a corridor leading to a back verandah with washroom and kitchen at the back and a small laundry behind. They originally had cesspits but these were superseded by water closets that were found in the yards. The latter were found to be largely bare earth with a number of rubbish pits dug into them. Next to the cottages was vacant ground and large numbers of rubbish pits were found here also yielding domestic waste including broken plates, bottles and scrap bones plus other fragments dating from the late nineteenth century. Some pits were certainly dug to dispose of wastes from around the house; one large one in the yard of 85 Barker Street had a quantity of broken window glass. Remains of the fence separating the cottages from the vacant land were also found. This archeological dig has given us an interesting insight into the lives of those families who previously lived on the current NeuRA building site. Aboriginal archeological excavation was also undertaken… but that’s for another post. “Archaeology is the peeping Tom of the sciences.” Jim Bishop, American journalist. Anne Graham is Communications Manager at NeuRA.